In this study, the effects of temperature (30, 50 ve 70 °C), time (0, 10 ve 20 days), concentration of copper and iron ions (0, 0.15 ve 0.3 mg kg-1 oil) and ascorbyl palmitate (AP) (0, 200 ve 400 mg kg-1 oil) on peroxide value (PV), malonaldehyde (MAD) and hexanal (HEX) content of soybean oil under accelerated oxidation conditions have been evaluated by response surface method (RSM). Besides of its rich linoleic acid (C18:2) content (55.81%), soybean oil had 8.69% linolenic acid (C18:3). The total tocopherol content of soybean oil was 538.5 mg kg-1 oil. Data obtained showed that temperature and time significantly increased (P<0.05) PV, MAD and HEX content of the samples. AP significantly decreased the formation of peroxides (P<0.05). Samples with copper showed higher PV and HEX values compared to those with iron. In general, the presence of copper and iron did not significantly (P>0.05) affect the oxidation. It’s concluded that temperature and time were the most important parameters affecting soybean oil oxidation (P<0.05). In addition to the reduced number of experimental runs, RSM provided an overall evaluation of the effects of different factors on oxidation parameters. Bu çalışmada sıcaklık (30, 50 ve 70 °C), süre (0, 10 ve 20 gün), bakır ve demir iyonu derişimleri (0, 0.15 ve 0.3 mg/kg yağ), ve askorbil palmitatın (AP) (0, 200 ve 400 mg/kg yağ) soya yağının peroksit değeri (PD), malonaldehit (MAD) ve hegzanal (HEX) içerikleri üzerindeki etkileri hızlandırılmış oksidasyon ortamında yanıt yüzey yöntemi (YYY) ile araştırılmıştır. Soya yağının zengin linoleik asit (C18:2) içeriği (%55.81) ile birlikte %8.69 oranında linolenik asite (C18:3) sahip olduğu saptanmıştır. Toplam tokoferol içeriği 538.5 mg/kg yağ olarak bulunmuştur. Veriler, sıcaklık ve sürenin yağların PD, MAD ve HEX içeriklerini önemli düzeyde artırdığını göstermektedir (P<0.05). AP’ın peroksitlerin oluşumunu önleyici etkisi önemli bulunmuştur (P<0.05). Bakır içeren örneklerin demir içerenlerle karşılaştırıldığında, daha yüksek PD ve MAD değerleri gösterdikleri tespit edilmiştir. Genel olarak bakır ve demirin oksidasyonu önemli düzeyde etkilemedikleri saptanmıştır (P>0.05). Sıcaklık ve sürenin soya yağının oksidasyonunu etkileyen en önemli etmenler oldukları tespit edilmiştir (P<0.05). YYY, örnek ve analiz sayısının azalması ile birlikte farklı faktörlerin oksidatif parametreler üzerindeki etkilerinin topluca değerlendirilmesine olanak sağlamıştır. Anonim (1990). Fruits, vegetables and derived products determination of iron content by flame atomic absorbtion spectrometry, ISO9526. AOAC 1990. Official Methods of Analysis of the Association of Official Analytical Chemists. AOAC. Washington. DC. Ayala A, Muñoz MF & Argüelles S (2014). Lipid peroxidation: production, metabolism, and signaling mechanisms of malondialdehyde and 4-hydroxy-2-nonenal. Oxidative medicine and cellular longevity, 2014. Azarbad MH & Jeleń H (2015). Determination of hexanal-an indicator of lipid oxidation by static headspace gas chromatography (SHS-GC) in fat-rich food matrices. Food analytical methods, 8(7), 1727-1733. Bastos LCS & Pereira PADP (2010). Influence of heating time and metal ions on the amount of free fatty acids and formation rates of selected carbonyl compounds during the thermal oxidation of canola oil. Journal of agricultural and food chemistry, 58(24), 12777-12783. Basturk A, Javidipour I, Boyacı IH (2007). Oxidative stability of natural and chemically interesterified cottonseed, palm and soybean oils. Journal of Food Lipids, 14: 170-188. Blekas G, Tsimdou M, Boskou D (1995). Contribution of α-tocopherol to olive oil stability. Food Chemistry, 52: 289-294. Choe E & Min DB (2006). Mechanisms and factors for edible oil oxidation. Comprehensive reviews in food science and food safety, 5(4), 169-186. Cillard J, Cillard P & Cormier M (1980). Effect of experimental factors on the prooxidant behavior of α-tocopherol. Journal of the American Oil Chemists’ Society, 57(8), 255-261. Coppen P (1994). The use of antioxidants. Rancidity in Foods (Editors: J.C. Allen, Hamilton R.J.) 3rd. Ed., Blackie Academic Press, London. 84-103. Devres YO ve Pala M (1993). Gıda Sanayinde Matematiksel Modellemenin Önemi ve Uygulama Alanları. Gıda, 18,3: 173-181. Farag RS, Hewedi FM, Abu-Raiia SH & El-Baroty GS (1992). Comparative study on the deterioration of oils by microwave and conventional heating. Journal of Food Protection, 55(9), 722-727. Fomuso LB, Corredig M & Akoh CC (2002). Metal-catalyzed oxidation of a structured lipid model emulsion. 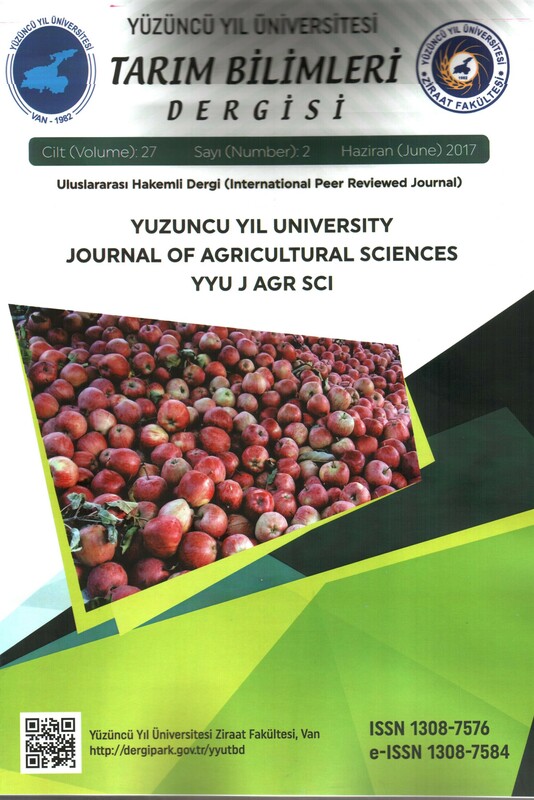 Journal of agricultural and food chemistry, 50(24), 7114-7119. Ghirardello D, Bertolino M, Belviso S, Dal Bello B, Giordano M, Rolle L & Zeppa G (2016). Phenolic composition, antioxidant capacity and hexanal content of hazelnuts (Corylus avellana L.) as affected by different storage conditions. Postharvest Biology and Technology, 112, 95-104. Halliwell B, Gutteridge JMC (2001). Free radicals in biology and medicine. 3rd ed. New York: Oxford University Press. p 297. Jaeho HA, Dong-Won SEO, Xi CHEN, Hwang JB & You-Shin SHIM (2011). Determination of hexanal as an oxidative marker in vegetable oils using an automated dynamic headspace sampler coupled to a gas chromatograph/mass spectrometer. Analytical Sciences, 27(9), 873-873. Javidipour I, Tüfenk R & Baştürk A (2015). Effect of ascorbyl palmitate on oxidative stability of chemically interesterified cottonseed and olive oils. Journal of food science and technology, 52(2), 876-884. Javidipour I, Qian MC (2008). Volatile component change in whey protein concentrate during storage investigated by headspace soild-phase microextraction gas chromatography. Dairy Science and Technology, 88: 95-104. Kayahan M (2003). Yağ Kimyası, ODTÜ Yayıncılık, 220. Kimoto H, Endo Y, Fujimoto K (1994). Influence of interesterification on the oxidative stability of marine oil triacylglycerols. Journal of American Oil Chemists Society, 71 (5): 469-473. Kochhar SP, Rossell J B (1990). Detection, Estimation and Evaluation of Antioxidants in Food Systems, Food Antioxidants (Editor: B.J.F. Hudson) Elsevier, New York. 19-64. Lee YC, Oh SW, Chang J, Kim IH (2004). Chemical composition and oxidative stability of safflower oil prepared from from safflower seed roasted with diferent temperatures. Food Chemistry, 84: 1-6. Liang C, Schwarzer K (1998). Comparison of four accelerated stability methods for lard and tallow with and without antioxidants. Journal of American Oil Chemists Society, 75 (10): 1441-1443. Lorenzo JM, Bedia M & Bañón S (2013). Relationship between flavour deterioration and the volatile compound profile of semi-ripened sausage. Meat science, 93(3), 614-620. Oboh G, Falade AO & Ademiluyi AO (2014). Effect of thermal oxidation on the physico-chemical properties, malondialdehyde and carotenoid contents of palm oil. Rivista Italiana Delle Sostanze Grasse, 91(1), 59-65. Porter NA (2013). A Perspective on Free Radical Autoxidation: The Physical Organic Chemistry of Polyunsaturated Fatty Acid and Sterol Peroxidation. The Journal of Organic Chemistry, 78(8), 3511–3524. Pratt DA, Tallman KA, & Porter NA (2011). Free radical oxidation of polyunsaturated lipids: New mechanistic insights and the development of peroxyl radical clocks. Accounts of Chemical Research, 44, 458–467. Roman O, Heyd B, Broyart B, Castillo R & Maillard MN (2013). Oxidative reactivity of unsaturated fatty acids from sunflower, high oleic sunflower and rapeseed oils subjected to heat treatment, under controlled conditions. LWT-Food Science and Technology, 52(1), 49-59. Serjouie A, Tan CP, Mirhosseini H & Che Man YB (2010). Effect of vegetable-based oil blends on physicochemical properties of oils during deep-fat frying. American journal of food technology, 5(5), 310-323. Shahidi F (1998). Indicators for Evaluation of Lipid Oxidation and Off-Flavour Development in Food, Development in Food Science, Food Flavours: Formation, Analysis and Packaging Influences (Editors: Contis, E.T., Ho, C.T., Mussinan, C.J., Parliment, T.H., Shahidi, F., Spanier, A.M.), The George Charalambous Symposium, Elsevier, Netherlands. 55-68. Shahidi F (2001). Headspace volatile aldehydes as indicators of lipid oxidation in foods. Adv. Exp. Med. Biol. 488, 13–123. Sherwin ER (1978). Oxidation and antioxidant. Journal of American Oil Chemical Society, 55: 809-814. Surai PF, Speake BK (1998). Distribution of carotenoids from the yolk to the tissues of the chick embryo. The Journal of Nutritional Biochemistry, 9: 645-651. Surai PF & Sparks NHC (2001). Comparative evaluation of the effect of two maternal diets on fatty acids, vitamin E and carotenoids in the chick embryo. British Poultry Science, 42(2), 252-259. Yanishlieva-Maslarova NV (2001). Inhibiting Oxidation. Antioxidants in Food: Practical Applications (Editors: J. Pokorny, N. Yanishlieva, M. Gordon). Woodhead Publishing Ltd., Cambridge, UK. 22-70. Thanonkaew A, Benjakul S, Visessanguan W & Decker EA (2006). The effect of metal ions on lipid oxidation, colour and physicochemical properties of cuttlefish (Sepia pharaonis) subjected to multiple freeze–thaw cycles. Food Chemistry, 95(4), 591-599.